Nesrin is a high school mathematics teacher who has set up a range of charitable projects. Some of these initiatives aim to empower women in the community by offering professional training and literacy courses, often run by female students. Her regional educational projects, notably those focusing on students who are afraid of mathematics, have led to a significantly higher pass rate amongst students and gained her school the status of a model school. She has launched an initiative to provide mathematics teachers across Jordan with a range of modern teaching tools and methods, which was implemented in cooperation with the Queen Rania’s Association for Educational Excellence. 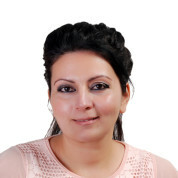 In addition, Nesrin has run a large number of teacher training courses and has published articles in the Jordanian Teacher’s Mission magazine. She has also led international student projects to transcend borders through e-learning and distance learning and to promote acceptance of different cultures and backgrounds. In recognition of her achievements, Nesrin was awarded Outstanding Teacher in the Kingdom of Jordan for 2009. Join the #TeachersMatter movement by sharing Nesrin Shafik Al Bakaeen’s update.